As humans, we are prone to love both our dogs and our food, but the two should not always mix. What may be delicious and nourishing for us can oftentimes be harmful to our furry best friends. Before you indulge Fluffy with a piece of your human food, do your research! Read below the following foods that are harmful to dogs first! Chocolate: This is a classic staple in most households, but chocolate is known for being bad for dogs. It contains caffeine and theobromine; which is harmful to dogs. If a dog eats chocolate it can cause vomiting, dehydration, abdominal pains, severe agitation, muscle tremors, irregular heart rhythm, elevated body temperature, seizures and death. Milk and Cheese: Like humans, dogs can suffer from lactose intolerance. Milk contains milk sugar, and dogs do not have the enzymes to break it down. Cheese also contains sugars and fatty components that dogs cannot digest. When a dog consumes these dairy products, they could experience gas, vomiting, diarrhea, and other gastrointestinal problems. Milk can also contribute to serious bacterial exposure that could eventually lead to disease and death. Onion and Garlic: Onions make you cry and vampires can’t handle garlic, but believe it or not, the two may affect your furry buddy more. Both onion and garlic contain compounds that can be harmful for dogs and can damage a dog’s red blood cells. This causes dogs to become weaker and move around less. The dog’s urine could be orange to dark red in color if garlic is consumed. In extreme cases, a blood transfusion may be necessary. Macadamia Nuts: Recent discoveries have revealed that macadamia nuts are harmful for dogs to eat. The specific chemical that causes the toxic reaction in dogs if ingested is still unknown. Macadamia nuts cause dogs to develop weakness and the inability to walk, vomiting, a staggering gait, depression, tremors, and hypothermia. Grapes and Raisins: Grapes and raisins are like macadamia nuts because it is unknown what chemicals and compounds are in grapes that cause issues for dogs. Consumption of grapes or raisins can cause kidney failure. Symptoms may or may not show up, but kidney failure can occur in 3 to 4 days. Dogs can begin vomiting or having diarrhea while also developing dehydration and experiencing a lack of appetite. Avocados: Guacamole is delicious, but not for dogs. The avocado leaves, pits, bark, and fruit contain a toxin called persin. This toxin can cause an upset stomach, breathing difficulties, and fluid buildup in the chest. The most dangerous part of the avocado is the pit because it is slippery and dogs can accidentally swallow it, which leads to obstruction of the gastrointestinal tract. Bread Dough: Carbs are bad anyways, right? The raw yeast dough that produces bread can ferment in a dog’s stomach, and this causes it to become toxic. Aside from that, bread dough can also expand in your dog’s stomach or intestines, creating a large amount of gas in the digestive system. This can cause a severe amount of pain and potentially cause the stomach or intestinal tract to rupture. Your dog may also experience vomiting, abdominal discomfort, and lethargy. Caffeine: Does your dog seem tired? Coffee is not the answer. Caffeinated beverages such as coffee have a stimulant called methylated xanthine. This stimulates the dog’s nervous system and could causing vomiting, restlessness, heart palpitations, and death. Xylitol: Found in sugarless gum, toothpaste and artificial sweeteners, xylitol causes increased insulin secretion, and this results in lower blood sugar levels for your furry friend. Effects of poisoning include vomiting, lethargy, a lack of coordination, seizures, jaundice, and diarrhea. Raw Meat, Fish, Eggs and Meat Bones: Meat bones can splint, causing choking, intestinal blockage, or tears in your pup’s digestive tract. Therefore, it is definitely safer to purchase nylon-based bone or pressed rawhide bone to help with your dog’s dental needs. Raw meat, fish, and eggs can transmit bacteria that are harmful to pets. Raw foods such as beef, chicken, fish, and eggs disturb your pooch’s digestive system. The size of your pup and the amount of bad food he or she consumes will depend on how much damage these foods can do. Dogs are not completely unlike humans; they react differently to foods that other dogs may have no issue with. Still, it is better to be safe rather than sorry and avoid the above foods along with whatever else your vet may suggest. Don’t be afraid to tackle Pinterest and make your dog a homemade treat! Also, remember to consult with your vet before feeding your dog any human food. Sometimes good food isn’t enough for your favorite fur friend. 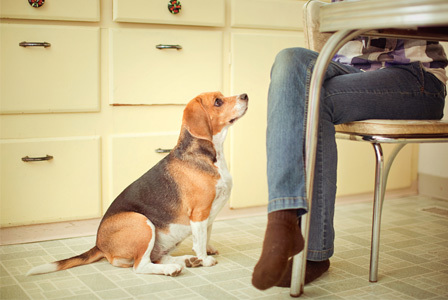 Dogs need socialization, too! At BauserHaus we provide that and so much more. Your dog is sure to make friends, receive the proper nutrition he needs, and be loved by our staff. Drop Fido off for a play day or for an extended stay. Call us at (314) 961-3911 or visit our website, www.bauserhaus.com, to learn more! This entry was posted in Tips and tagged BauserHaus, BauserHaus STL, doggy daycare STL, good human food for dogs, poisonous food for dogs, what to feed dog, which foods are good for dogs, which foods can hurt dogs. Bookmark the permalink.